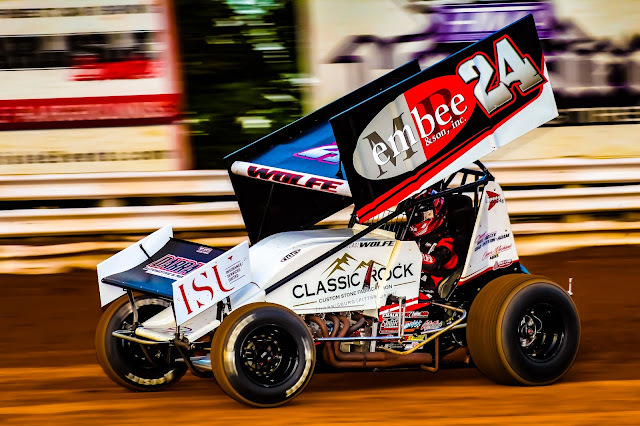 Mechanicsburg – Lance Dewease and Lucas Wolfe split a pair of 410 sprint car mains held at Williams Grove Speedway on Friday night to lower the curtain on the 2018 racing season at the oval. Dewease’s win came in the make-up Al Hamilton Tribute/Dirt Classic Qualifier and was worth $5,077 for the 30-lap win. Wolfe wired the field in the regularly scheduled 410 sprint main to score a $3,800 payday. New England driver Kyle Smith took the checkers in the Keystone RaceSaver feature for 305 sprints to end the night and the year. Dewease started third in the Hamilton Tribute event and watched as TJ Stutts led from the start with Brian Montieth muscling from sixth to second by the second lap. Stutts was working hard to stay ahead of Montieth and was beginning to work traffic on the eighth lap when Montieth was able to sling by in the first turn for control. But before the lap could be completed, the yellow flag appeared, forcing Montieth back to second while giving Stutts new life at the front of the field. And with that new life, Stutts was able to pull away a bit on the restart as Dewease wrestled with Montieth for second. Stutts had again just entered traffic, this time with nine laps to go when he suddenly slowed and withdrew from the event, hading Montieth control of the race. Montieth began working the rear of the field with two laps to go. A surprising move by Montieth found him dropping off of his favored outside lane on the 24th lap as he set the car into the first turn while trying to put a car a lap down. And when that car forced Montieth to miss he lowside entry, Dewease catapaulted his No. 69K around his outside to grab control and speed to the victory by 1.146 seconds. With the win, Dewease pushed his two-race total winnings to $61,077 after also claiming last Saturday’s National Open at the track. Brian Brown rode home third followed by Lucas Wolfe and Danny Dietrich. Wolfe led all 25 laps of the other sprint car main with Kody Lehman chasing him early before Cory Haas blasted to his inside for the spot on the fifth lap following a restart. Wolfe pulled his advantage out to a full straightaway by the finish to get the win by 4.248 seconds. 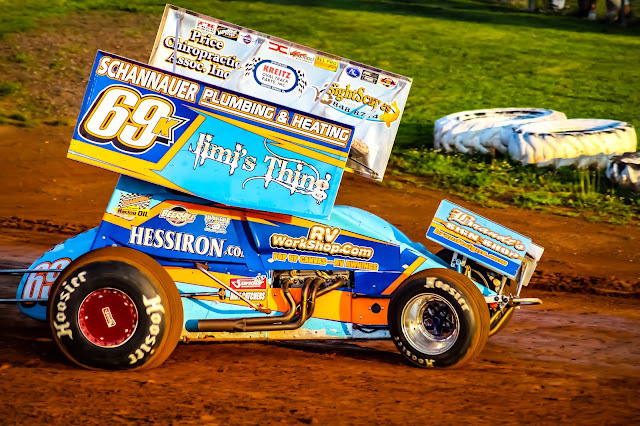 After starting 11th in the field, Freddie Rahmer worked his way forward to take second from Haas with six laps to go only to run out of time to run down Wolfe. Dietrich was third followed by Haas and Dewease. Heats went to Jason Shultz, Kyle Moody and Brian Brown with Brian Montieth taking the consolation race. Ritchey side by side through the turns for several laps. Ritchey led from the outset with Smith motoring into the second spot on lap four after starting the race in fifth. Smith drove away from the field after taking the lead to pick up the win by 7.238 seconds. Ritchey held on for second followed by Tyler Denochik, Darren Miller and Scott Ellerman. Heats went to Jeff Geiges, Scott Ellerman, Kyle Smith and Darren Miller with twin consolations going to Tyler Reinhardt and Ryan Stillwaggon.